Cranberry Orange Bread – doesn’t that flavor combination just make you think of Christmas? I made this bread last weekend using the cranberries I had left after making the cranberry relish. (Side note: does anybody know how long cranberries will last in the fridge?) If there are any cranberries wasting away in your refrigerator, go get them right now and make this bread. If not…well, this bread is worth a quick trip to the grocery store. The bread itself is sweet and dense and a little crumbly. The cranberries are tart, but when surrounded by the sweet bread, you barely notice the tartness. As I said above, the flavor pairing of orange and cranberry is perfect for Christmas and is absolutely delicious. The bread gets better as it sits, so I’d recommend making it a day in advance of when you want to serve it. Mike liked this bread a lot more than I thought he would. I thought he’d be turned off by the cranberries, but considering how much he’s eaten, I don’t think that was a problem. As for me, I love this bread. I just may start stockpiling bags of cranberries in the freezer (like my mom!) so I can make it year round. *Note: The recipe makes 1 normal size loaf of bread. I made two smaller loaves because I think they’re cute and because all of my normal size loaf pans were already in use. *Note: original recipe called for 1/2 cup roughly chopped walnuts. I left them out due to a nut allergy in the family, but I think they would be a great addition! Preheat oven to 350 and grease a loaf pan. In a large bowl, mix together the flour, baking powder, baking soda, salt, orange zest, cranberries and walnuts if using. In a separate bowl, whisk together the melted butter, granulated sugar and egg. 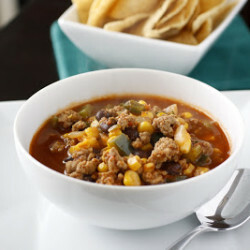 Combine the wet and dry ingredients and stir to combine. The dough will be on the dry side and almost resemble sugar cookie dough. Press the dough into the greased loaf pan and sprinkle sugar over the top. Bake for about an hour to an hour and fifteen minutes. The top of the loaf will be a rich golden brown. Let cool before slicing. If the cranberries are too tart for your taste, serve with butter and honey on top. I like it with just butter, but Mike prefers the butter and honey. Megan, this looks great! i've been meaning to make cran bread since Thanksgiving…. 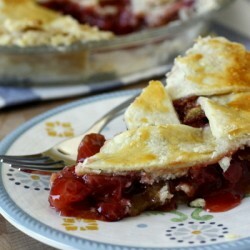 I love how cranberries are often used in this blog. I made your cranberry bliss bars and they were really delicious! This looks like the stuff from Starbucks… only waaay prettier! Delicious, Megan! I'm making orange, cranberry muffins this weekend — they are perfect this time of year. “4. How long can I store fresh cranberries in the refrigerator? In the freezer? Wow this looks delicious and perfect for Christmas! Looks great!!! as always I love the site, always so yummy!! 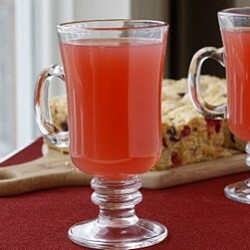 pajamachef – Thanks for the cranberry info! Good to know. The cranberries in this look beautiful! Love the cran-orange combo. What gorgeous loaves of bread, they look soooo good. 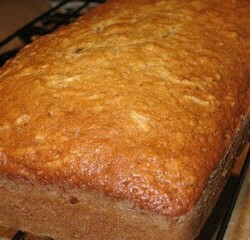 I LOVE cranberry orange bread! Just finished making this and their in the oven. I doubled the recipe and made two mini loaves, one for us and one for our sweet mailman. Then I'm also trying this recipe out for muffins. Not sure- but we'll see. What do you think? Melissa – I hope you like it! You'll have to let me know how it turned out. I think muffins would be great, maybe a little more dense than traditional muffins, but still good. That looks so yummy, I can almost smell it and taste it just looking at the pic! I really want to bite into that cranberry orange bread, yum! This bread looks amazing! I love baking with cranberries. Their tartness really balances out the sweetness of baked goods well. I see myself making these as soon as my Christmas goodies finally clear out. 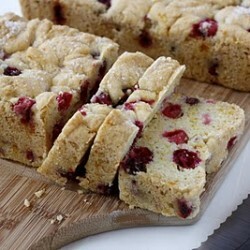 Oh delish, cranberry and orange are SUCH a great combo in baked goods.